Extending the (unplanned) Euro-focus of the blog for the third day in row, we’re recommending yet another group from across the pond. 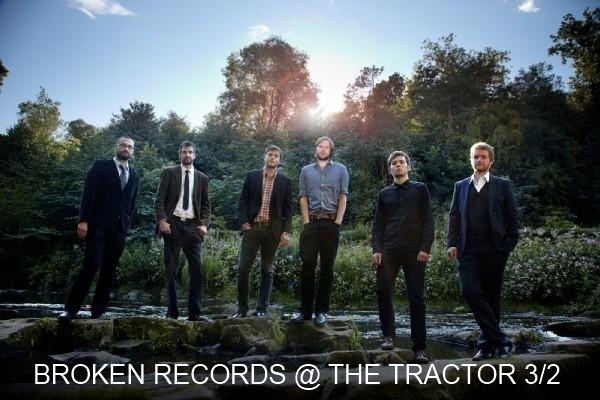 Broken Records, tonight’s recommended headliner, hails from Edinburgh and will be bringing their Scottish take on indie rock with folk elements to the Tractor Tavern this evening. The band claims influences of early R.E.M. and the Boss among others though the comparison that comes to mind for us is Sam’s Town-era Killers, which as coincidence has it was released mere months before the band’s founding. So essentially, if you like the Boss and more specifically his 21st Century protégés like Brandon Flowers or Brian Fallon (of Gaslight Anthem) we predict you’ll really be into the Broken Records. Surface, though we’d argue deeper, comparisons aside, the band promises to deliver a stellar performance tonight that couples their emotive lyrics with piano, cello, violin plus accordion-enhanced rock instrumentation. Even better still, before deciding whether or not the Tractor’s in the cards for you tonight, you can catch the band for free at the Ballard Sonic Boom starting at 7 PM. If that’s not enough to entice you, featured act U.S. Royalty who hail from our nation’s capital, promise to put on a high energy show that melds other influences that likely hold a special place in your heart. The DC quartet pull together Canyon Rock elements with Anberlin-esque vocals to great effect. Check out their video for Equestrian below or head over to their bandcamp full album stream to hear it for yourself. Best yet, head to the Tractor to take in the full experience. Local openers Ambulance will kick things off around 9:30 PM.